'Tis better to give than to receive: it's a message that many adults have absorbed, but most kids, with their lengthy holiday gift wish lists, haven't quite gotten the memo yet. Teaching our kids about giving back and volunteering is one of the most rewarding and important parts of parenting, but finding a time and place for little ones to help out can be elusive. Many organizations aren't even equipped to handle mini volunteers, which is why we swooned when we saw the craft boxes from Little Loving Hands. 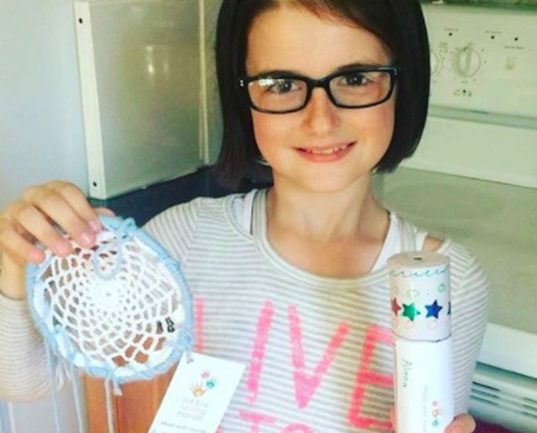 Each craft box comes with a craft/service project, and they are a great opportunity for kids to feel that they are actively helping others while expressing themselves creatively. After completing the art project and learning about the monthly spotlight organization, kids send the project on to the worthy groups, which include charities and non-profits around the world! The projects are super kid-friendly and fun, with examples such as creating a heart pillow and a matching game for a homeless mother and child, crafting baby gifts for an expectant mother in Haiti, and making a tambourine to be used by Clowns Without Borders, a non-profit that sends entertainers to bring laughter into the lives of those living in conflict zones and refugee camps. Other previous spotlight groups include a foundation providing school supplies to poor communities around the United States, an organization that provides support and awareness for young cancer patients, and a food bank serving the elderly. Once your kids have completed and mailed the projects from their craft boxes using the pre-paid return envelopes, there’s still more fun to be had. If you have additional crafting materials at home, they can recreate the crafts for their own enjoyment or be inspired to send along more to the target organization. Kids will also adore the certificate of achievement and collectible button they earn from each box. Each set also comes with information regarding the spotlight organization for parents to discuss with their kids, providing a gentle, relevant way to talk about tough topics like pediatric cancer. Little Loving Hands boxes are awesome because kids can feel overwhelmed by the number and magnitude of problems in the world, and completing these craft/service projects literally puts the power of providing change and help in their little, yet capable hands. 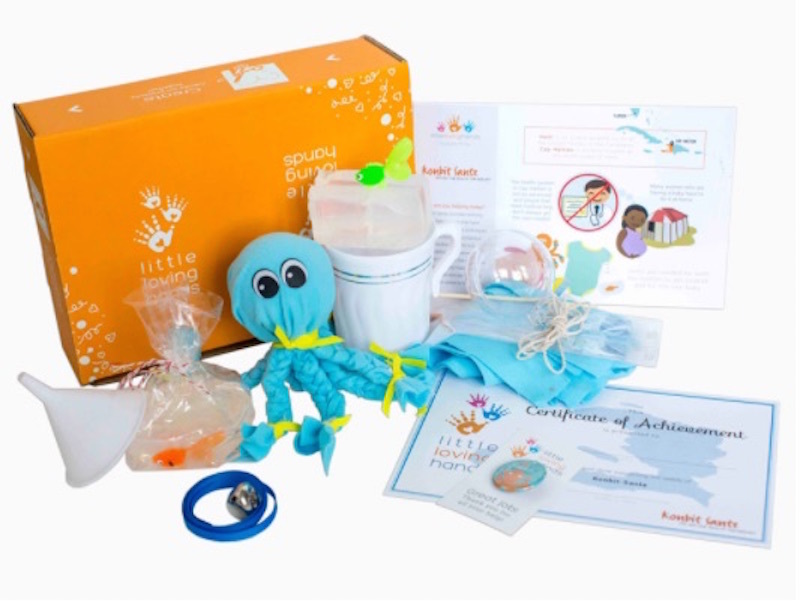 These boxes also serve as a reminder to parents that getting kids involved in giving can be done at an early age and can be fun as well as educational for tots. Little Loving Hands boxes are available by monthly subscription, and there are also options for one-off boxes as well as choices for gift-giving. Add this awesome box service to our list of favorite non-materialistic, experiential gift ideas! Once your kids have completed and mailed the projects from their craft boxes using the pre-paid return envelopes there's still more fun to be had. If you have additional crafting materials at home, they can recreate the crafts for their own enjoyment or be inspired to send along more to the target organization. Kids will also adore the certificate of achievement and collectible button they earn from each box. Each set also comes with information regarding the spotlight organization for parents to discuss with their kids, providing a gentle, relevant way to talk about tough topics like pediatric cancer. Little Loving Hands boxes are awesome because kids can feel overwhelmed by the number and magnitude of problems in the world, and completing these craft/service projects literally puts the power of providing change and help in their little, yet capable hands. These boxes also serve as a reminder to parents that getting kids involved in giving can be done at an early age and can be fun as well as educational for tots. Little Loving Hands boxes are available by monthly subscription, and there are also options for one-off boxes as well as choices for gift-giving. Add this awesome box service to our list of favorite non-materialistic, experiential gift ideas!